There's a lot of chatting in my Yahoo Groups about vacuums lately. I always chime in and let eveyone know how much we love our Dyson Animal. With several furry creatures under foot everyday, we need something that can really tackle the pet hair and cat litter. Dyson does it all. DH and I still laugh about how stunned we were the first time we used it. We thought our other vacuum was good, but the Dyson picked up so much we were just blown away. 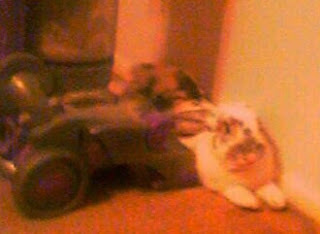 As you can see from the awful cell phone picture - Chopper loves the Dyson too! I hope I love mine as much as you love yours! Good to know!! You are such a good "mamma" to all your creatures. Take care.